This entry was posted in cookies, TWD and tagged cookies, dulcedeleche, TWD. Bookmark the permalink. Your cookies look so mini and cute on the cake stand. Mine spread alot more but still delicious! Glad you and friends enjoyed the cookies. I love the cake stand, Claire! To clarify, I wasn’t being passive aggressive I was just pointing out that you refused. Statement of fact really! Guess with you going on vacay and all I have to do next week’s! Hey… all turned out well cus your cookies are amazing! I enjoyed this recipe too! 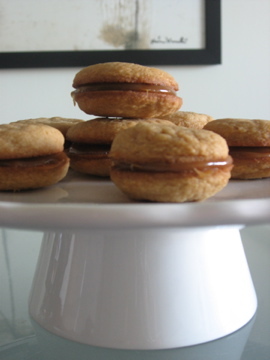 I used the PC dulce de leche too, but left out the white sugar and ended up with lumpy cookies. Glad you liked them! I’m impressed that yours are so tall and puffy. Very nice! Yours are so cute! Thanks for baking with me this week!! Gorgeous, gorgeous! I love the presentation! I didn’t think it was passive aggressive! haha!!! Sometimes (okay, often) I can’t tell you two apart in your posts and I couldn’t remember who had done last week’s so I totally didn’t know who was calling whom passive-aggressive. It could have gone either way! Aren’t sisters great?! Your cookies look great on the cake stand! Too pretty! Great little sammys. These were good weren’t they. Your cookies are adorable and I’m glad they were a hit! These look great! I wish mine had been all puffy like yours! They look delicious! I had to do a rewind this week, didn’t have the ingredients. Still want to make them though! awesome puffiness. they almost look like macarons. a little. Fat cookies!! Love them, mine spread like crazy and turned out superflat…. Yours are cute! These were really yummy. Hey, I think I’ve got that cake stand! I got mine from Marshalls a few weeks ago! Can’t wait to use it! Your cookies look fab!! !